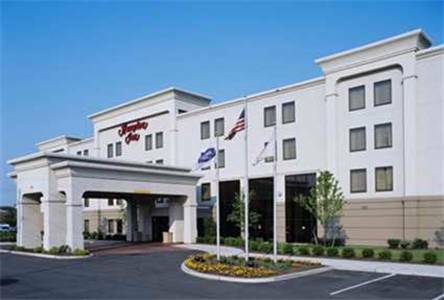 This hotel is 100 PCT Non Smoking The Hampton Inn Linden hotel is adjacent to New Jersey*s Linden Airport just five miles from Newark Liberty International Airport and 25 minutes from New York City. The hotel provides complimentary transportation to both airports daily from 7am-1030pm. This Linden New Jersey hotel is decorated with upscale attention to details with the warm features of home. As you enter our Hampton Inn lobby relax and enjoy the comforts of the warm fireplace mosaic designed marble floor and leather seating. Linden hotel guests can dine just steps away at Applebee*s or Boulder Creek Steak House and shopping is within walking distance. The Linden Hampton Inn offers 149 beautifully appointed hotel rooms 16 of which are Whirlpool Suites 6 are King Studios and both are equipped with refrigerators and microwaves. Our amenity filled hotel rooms include coffeemaker hair dryer iron and ironing board cable TV with On-Command pay-per-view movies and complimentary HBO and video games. New Jersey guests will enjoy complimentary high-speed internet access spacious work desk with an ergonomic chair and two phones with data ports voicemail speakers and complimentary local calls. Sure to please the busy executive or leisure New Jersey traveler Linden Hampton Inn hotel guests will enjoy complimentary deluxe On the House hot breakfast buffet served daily in our atrium lobby. Our Suite Shop is open 24 hours a day for light snacks beverages or toiletries. Every guest is certain to enjoy our fitness room and seasonal outdoor swimming pool. Our New Jersey business travelers have the convenience of our complimentary business desk services or our Executive Boardroom or meeting room facilities. We love having you here in New Jersey at the Hampton Inn Linden hotel. Convenience at your fingertips. From that light snack or beverage at check-in to a light dinner and a drink to take back to your room or perhaps that midnight ice cream craving we have it all.